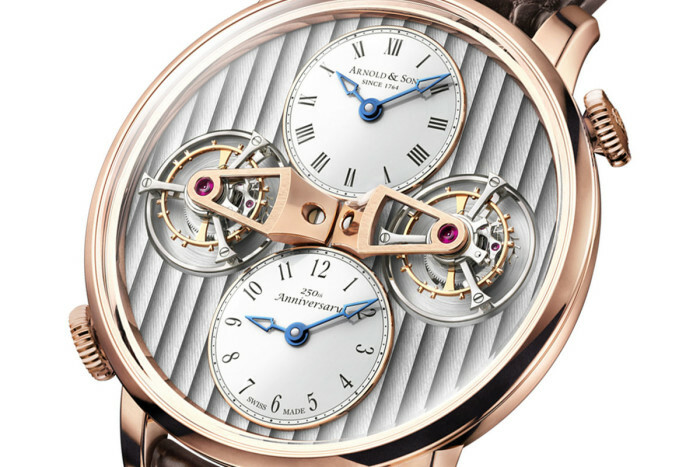 Third and final watch of the series to celebrate company’s 250th anniversary, Arnold & Son has unveiled the dual time Double Tourbillon Escapement Dual Time watch. 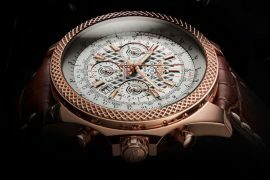 The DTE highlights a mixture of traditional watchmaking with modern technology and design. Powered by in-house made automatic A&S8513 caliber movement, it features dual time zone displays that can be set up independently. Each display has its own mechanism, gear train and tourbillon escapement. Symmetry is a big part of the DTE watch, time sub-dials are at 12 o’clock and 6 o’clock. The tourbillons decorated with 18 karat gold bridges are located at 3 o’clock and 9 o’clock while crowns are placed at 2 o’clock and 8 o’clock. 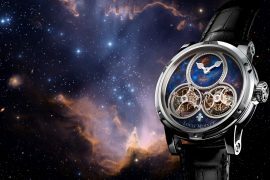 Dual time zones in dual dials are accurate by quarter or half-hour to Greenwich Mean Time thus giving wearer precise time in a second time zone. The dial at 12 o’clock with Roman numerals is for local time while the dial at 6 o’clock with Arabic numerals displays the second time zone. Both sub dials are white lacquered and the main dial plate features vertical Côtes de Genève stripe decoration. Both dials has blued hour and minute hands. 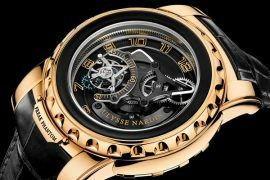 Housed in a 43.5 mm case made from 18 karat red gold, the movement features a 90 hour power reserve, 30 meter water resistance and 21,600 vph frequency. Visible through the crystal sapphire case-back movement’s highly finished decorations include hand-chamfered bridges, circular satin-finished wheels, and blued screws polished to a mirror finish. 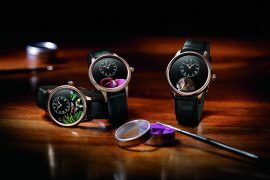 Finally, the watch come with a beautiful hand-stitched black or brown alligator strap. 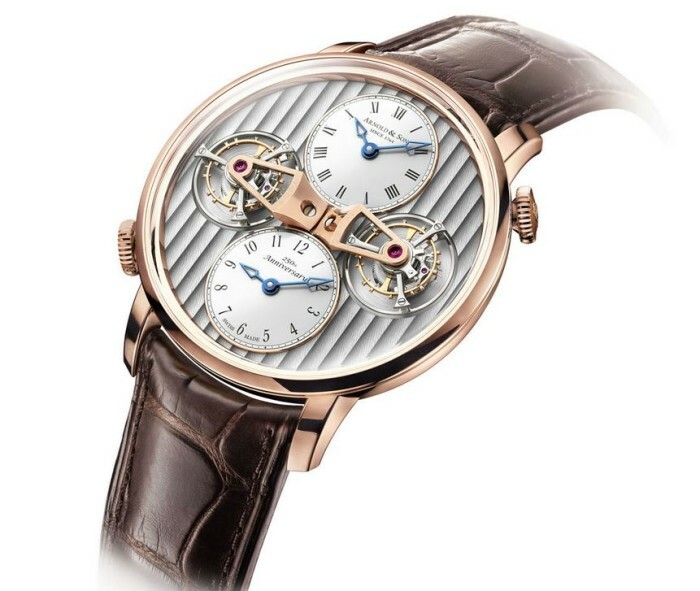 Limited to just 28 watches, the Double Tourbillon Escapement Dual Time has a list price of $210,000.